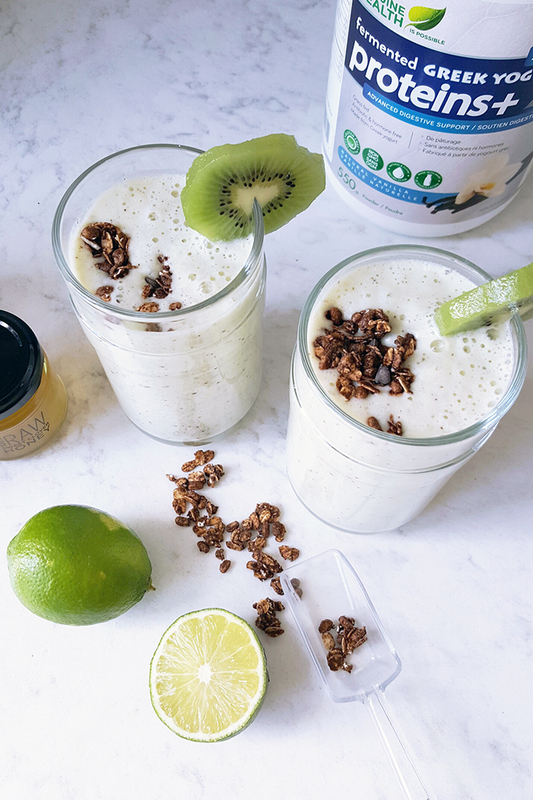 A few weeks ago, I shared a fun and easy protein packed Breakfast Cup recipe combining yogurt, fruits, granola and Genuine Health‘s fermented Greek yogurt proteins+ products. 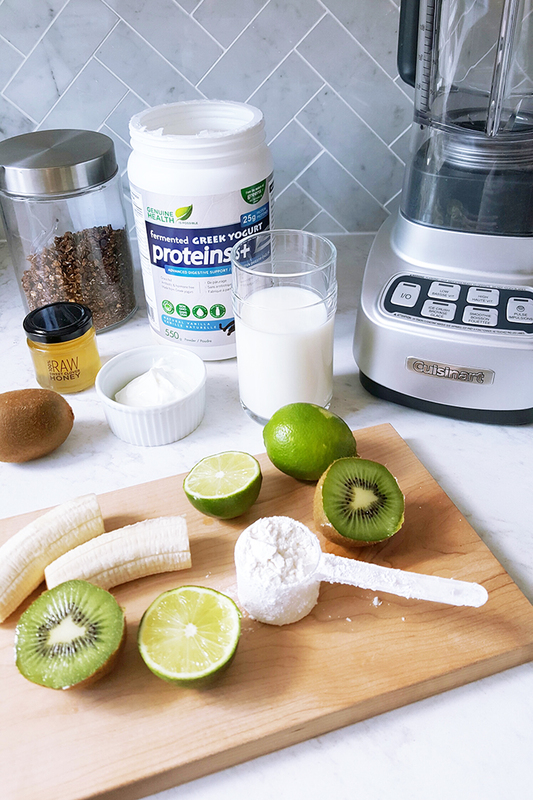 This is the first time I’ve ever tried protein powders and products for an extended period of time and I felt inclined to share my overall experience with you and of course – another quick, simple, and delicious recipe as well! 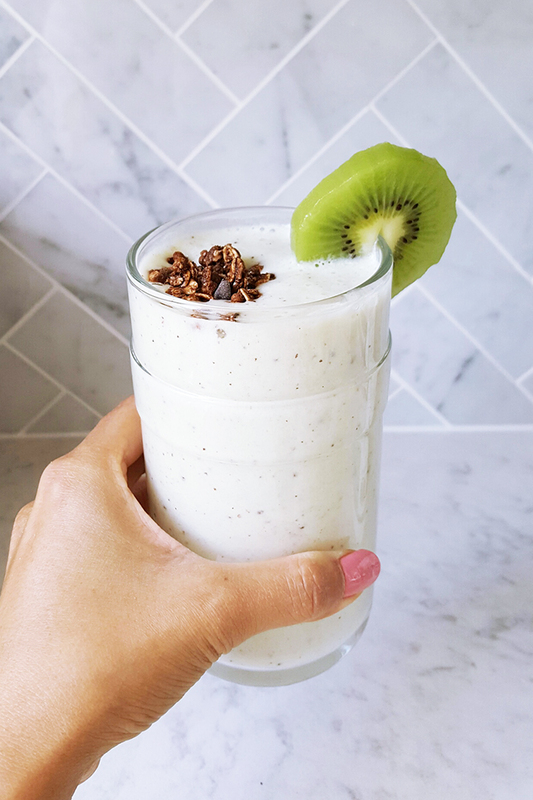 Inspired by my mini lime tree, I decided to try this Kiwi Key Lime Smoothie with an added touch of the Genuine Health fermented Greek yogurt proteins+ in the vanilla flavour. 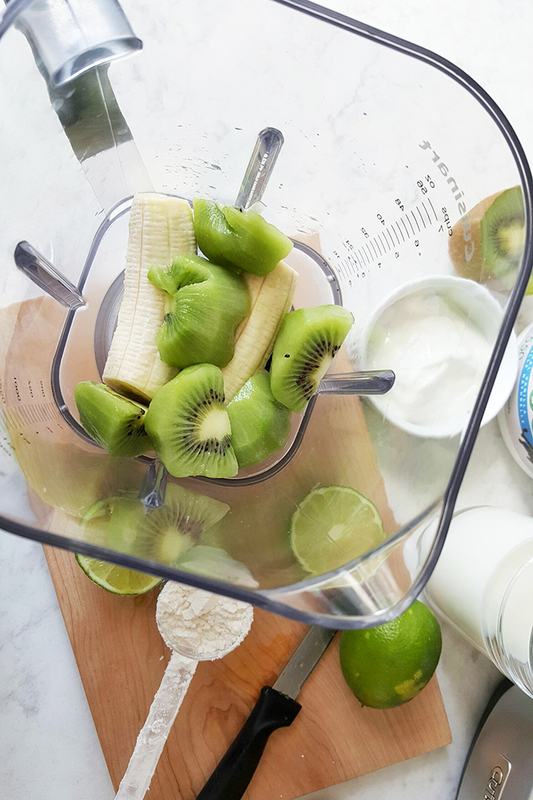 Read more to see the full Kiwi Key Lime Smoothie recipe and my full review! Combine the first six ingredients in a blender and blend on the smoothie setting for 2 minutes / Pour into glasses and garnish with granola and fruits / Enjoy! Admittedly, I’m no health nut or gym rat, but I do know that protein is used for muscle production and many people choose to drink a protein shake after a workout because it is the best time get protein so that it can begin to repair the small tears in your muscle tissues caused by contraction during a workout. I’ve given some whey protein powders a try and found that it causes bloating and indigestion – which of course can be quite discomforting. With Genuine Health’s fermented Greek yogurt proteins+ I get nutritional goodness without bloating due to the unique fermentation process from California grass-fed diary, it also has more than 6x’s the calcium of whey protein. Fermentation unlocks critical amino acids for optimal absorption, promotes overall digestive health and healthy gut bacteria. Ultimately, what it really means is that my body can optimally absorb and smoothly digest 25 g of complete protein per serving. Fermented Greek yogurt proteins+ is available in two flavours: vanilla and plain & unsweetened. 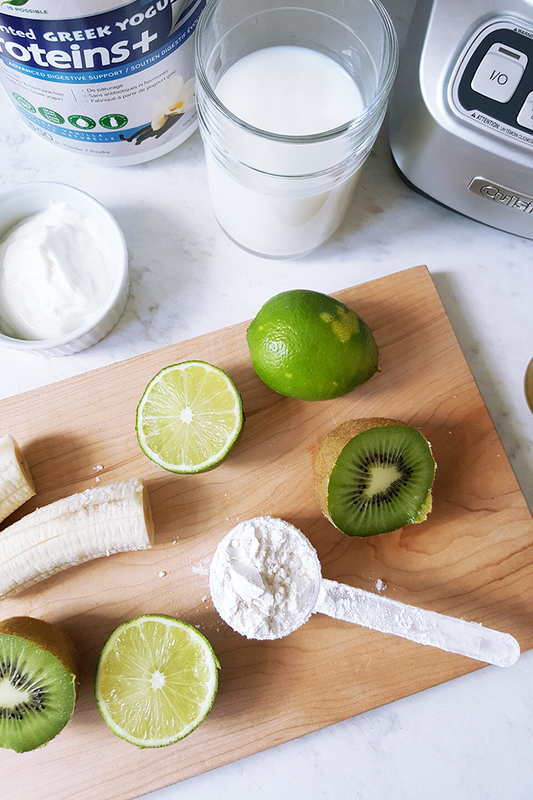 It is perfect to add to your favourite smoothie, baked recipe (muffins, bars, breads), or can be enjoyed simply shaken with water, milk, or any beverage of your choice. Overall, I really enjoy the taste and benefits of the Genuine Health fermented Greek yogurt proteins+ product line – I’ve not experienced any bloating or indigestion. I’m also making a habit by to drink a protein shake after each workout to jump start the repairing and rebuilding of muscle tissue. This is also resulting in the decrease of that “pain” I typically get after an intense workout. 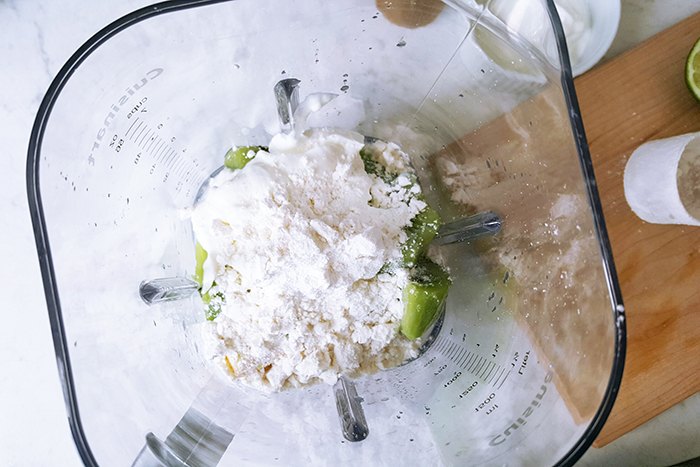 If you’re interested in something on the go, give fermented Greek yogurt proteins+ bars a try. Each bar has 15 grams of protein and they’re dipped in a decadent vanilla coating. I based my breakfast cup recipe using these bars, and they’re super fantastic in the morning. I encourage you to learn more about fermentation process by checking out this infographic for more details or feel free to visit a store nearby.